The line of Livestrong exercise bikes provides athletes and novice exercisers the ability to work out on affordable, quality equipment. If you need an intensive indoor cycle with a 40-pound flywheel, or a comfy recumbent for a more casual and relaxed workout, Livestrong has a model for you. Livestrong® Fitness of Madison, Wis., is a subsidiary of Johnson Health Tech Co., Ltd., the fourth-largest fitness equipment manufacturer in the world. Johnson also produces AFG, Horizon, Vision, and Matrix brands. Livestrong cardio products, which include treadmills and elliptical trainers as well as exercise bikes, are endorsed by Lance Armstrong, the former pro cyclist and a cancer survivor. As a result of Lance’s involvement in the company, a portion of each sale of fitness equipment is donated to LIVESTRONG, the Lance Armstrong foundation, which was launched in 1997 to improve the lives of people affected by cancer. UPDATE: Johnson Health & Fitness is no longer selling any bikes or other exercise equipment under the LiveStrong name. Check out their Horizon line for comparable bikes. 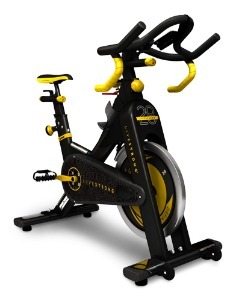 Livestrong has a limited line of exercise bikes that includes a Special Edition Indoor Cycle with a 40-lb. flywheel, premium aluminum seat, adjustable handlebars, and dual-sided SPD pedals with toe clips. Only 500 bikes will be produced. 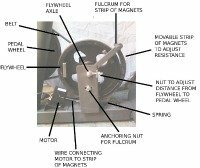 Livestrong’s regular Indoor Cycle also features a 40-pound flywheel. It has a Kevlar® belt system, adjustable seat and handlebars with limitless combinations, and a cantilevered braking system. The cycle package includes a free DVD training packet with 54 challenging workouts for all training levels. 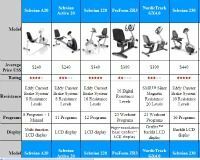 The last of the line-up that needs mentioning is the affordable $700 Livestrong Recumbent exercise bike that features a step-through design, 14-lb flywheel, wide contoured seat cushion, extra high seat back, and more. Don’t let weather or traffic prevent you from exercising and taking part in an active life. Take advantage of indoor training on one of these exceptional Livestrong exercise bikes, and help spread the message of LIVESTRONG in the fight against cancer. If you are serious about getting in shape, read a few reviews on the brand and you will be convinced that this Lance Armstrong-endorsed brand can help you reach your fitness goals. Livestrong LS7.0B Recumbent - a well built indoor cycle that easily earns its Lance Armstrong endorsement. Value-priced, rivals many higher-priced units. Livestrong LS9.9IC Indoor Cycle - Compares favorably to the outstanding Spinner Pro and Spinner Velo made by Star Trac; great for outdoor cyclists needing an indoor trainer. Livestrong LS28IC Indoor Cycle - Train on the LS28IC Indoor Cycle, just like Lance Armstrong, the Tour de France pro-cyclist who says it’s the best bike there is. Only 500 units will be sold! Livestrong LS5.0R Recumbent - Well-designed programming takes your weight loss fitness goals, strength, and endurance to the next level. Livestrong LS6.0R Recumbent - Upgrade of the LS5.0R - includes a contour mesh back seat, higher resistance, and built-in Livetrack Interactive™ technology. 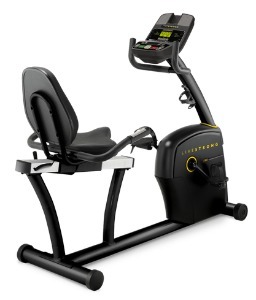 Livestrong LS5.0U Upright - Comes with Livetrack Interactive™ technology to track your fitness progress as you work out to an excellent selection of cardio and weight loss programs. Livestrong R1x Recumbent - A club level model with a self-powered generator system and an extended home warranty. Livestrong U1x Upright - A club quality bike backed by a premium warranty and best-in-class components. Livestrong S-Series Indoor Cycle - Designed for high-use commercial facilities or anyone who wants a club quality bike for the home gym. Livestrong E-Series Indoor Cycle - Designed for high-octane group exercise, yet offers the comfort and quiet performance you want for solo training sessions. Less specs than the S-Series and $300 cheaper.